As long as I can remember, I’ve been an artist. In childhood, drawing merged with nature study as I explored the nearby woods. I often quip, “I was raised by trees.” I’m not joking. All these years I’ve carried a deep sense of the primacy of nature, the consciousness of trees and other plants, the wisdom of waters and stones, and the communicativeness of all animals. At that time I could not have learned this from any human source. You could say, we don’t need to learn it, we’re born knowing it. Then the mystery becomes, How was I saved from forgetting? The trees saved me, and art saved me. When freed from obligation to create pretty pictures or imitate a camera, the process of art is a very deep opening into mystery. Like ancient Chinese artists who painted bamboo to understand bamboo, I paint to understand what I’m painting. Amid the anguish of environmental destruction, I paint to understand the relationship between human beings and the rest of our family. In college I made a commitment to create art that would heal the earth. Later I guffawed at the hubris of this idea. Humans healing the earth? We’re the disease! If we’re lucky, the earth will heal us so we can live peaceably with the rest of life. Then my work has become ritualistic: painting as a prayer for healing. A recent work, Salmon Sonnet, satisfied this urge. 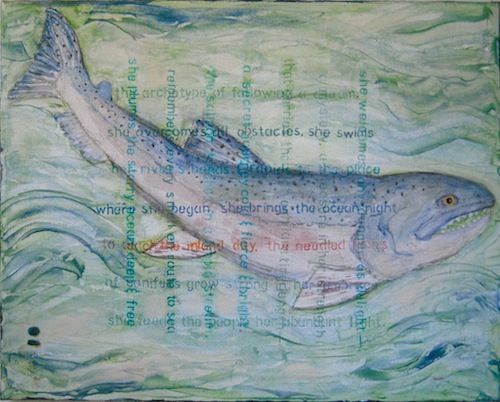 I planned to print a salmon poem on a canvas in a grid, then paint a salmon over it. First, I painted a dedication on the back: the salmon have always been very spiritual to us. Now we don’t know if they’ll survive, & if they do, if they’ll be edible.” Around the stretcher bars I wrote, the salmon prays for us, that we be fed with their generosity, so that we are generous, so that we recognize that the great conifers along their rivers are our parents & grandparents. Next I stenciled my poem with fine point Sharpies, then painted the salmon and its water so the poem shows through the paint. Each time before painting, I sang the poem while rattling or drumming. The poem departed the literary into the sacred. Creating this image became a communion with salmon interdependent with land, water, and spirit. Mystery blazed the afternoon I finished. My daughter’s friend caught a salmon and gave me half. Confronting the enormous head half of this beautiful fish, and the daunting task of cutting her into pieces for the freezer, I felt a moment of horror at being part of her death. Then I became a blessed and grateful participant in a luminous cycle of living generosity. Later, eating her flesh, I finally understood the last line of my poem: she feeds the people her abundant light. I understand this experience as an artistic experience, because I received it through willingness, day by day, year by year, to surrender to mystery. Clutching my pencils and paints, I stand before salmon, redwoods, hawks, and rivers. I ask, what do you want me to paint? Then, however odd the reply, I do my best to paint it. Time after time I suffer painful uncertainty before paper and canvas. Mystery does not confine its requests to what I know how to paint. Mystery is not content to have me repeat past successes. It’s off into the unknown, again. Artists often strive to capture faithfully some aspect of visual reality. Seeking to portray the forces of ecological harmony, I need to paint the invisible as well.Many recent paintings depict spirit beings I’ve never seen. How do they get on my canvases? Sometimes a sketchy image arises in my mind. Sometimes a title, no kidding, sends me to the drawing board: Now what does that look like? Sometimes a relationship builds over time until I want to honor it visually. Thunderbird is like that. In the high desert a few years ago, I raised my face to a snow flurry that followed thunder and lightning. I all but saw the snow kachina. I knew then that the nature spirits represented by Hopi and Navajo kachina carvings are not metaphorical, but express real forces. I don’t remember beginning a relationship with Thunderbird, but by the time I painted this, his perspective had become a trusted guide. This image was painted to honor my experience of Thunderbird’s vastness and power, a personally approachable consciousness within the movement of clouds across the continent, the instants of illumination, the echoing booms of change. Bird Grandmother in the Redwood Grove merges the visible with the invisible. Many times walking in forests I’ve felt an urgency to express the powerful spiritual consciousness breathing among those trunks and boughs. This image comes from deep peace mingled with excitement in Armstrong woods—something ancient, primal, and beautiful beyond human understanding. 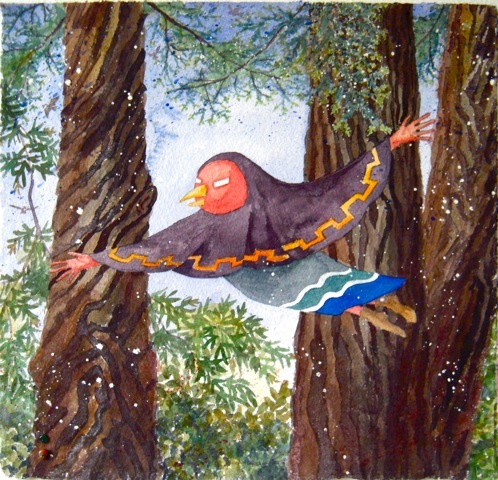 Bird Grandmother’s flight dances the joy of our hearts as we walk among redwood giants. As I finish a painting, the final prayer element of my work is sewing a drilled stone to the paper or canvas. With this stone I dedicate the work to the good of all our relations. There are many reasons to make art. What drives me—besides the sheer joy of color and goop—is my longing, shared with so many people, to live in a healed and harmonious world. I paint to soothe the agony of witnessing beautiful species die, irreplaceable lands devastated. It may be an illusion to think what I paint makes any difference, but it is the best I can offer. I hope that people who see my work are inspired to help in their best ways, to believe their own experiences of mystery, and to connect consciously to all the beings in our miraculous earthly family. I also offer it in a shamanic sense, believing that by means that we do not and cannot understand, that the invoking of abundant salmon by a tiny artist can call the conditions of abundant salmon into being. That the invoking of love for a crow or a redwood can strengthen the love for crows and redwoods in countless hearts. That giving visible shape to Thunderbird and Bird Grandmother can return thankful and responsive awareness of nature spirits to the ordinary activity of culture. I’m delighted to be able to present my pictures at Sebastopol Gallery. Now in our sixth year, we’re happy to provide a place for community members to enjoy visual expression and craftsmanship, and to discuss the value and purpose of art. Our members and guests include Chris Boyd and Connie Robeson, ceramics; Kalia Kliban, woodturning; Ev Jensen, James Reynolds, Teri Sloat, Susan St. Thomas, Paula Matzinger, Bert Kaplan, and Robert Breyer, painting; Colin Lambert and Jim Pollare, sculpture; Joann Lustig, Jane Garibaldi, Roland, Shelley Rae, and Carol Decker, jewelry; Amanda Lane, photography; Rebeca Trevino, assemblage; and Jean Salatino, Steven Gandolfo, and Skip Thomsen, glass. We also host musicians, poets, and playwrights. See more about the artists here. Debra Grant will be playing halo, a mysterious metal instrument, at my reception on Saturday, August 25, 5-7pm. On Friday, September 7, I’m giving a talk called “Painting with All Our Relations.” Talk means conversation, not lecture. Please bring your questions and ideas about how art supports—or doesn’t support—our efforts toward environmental healing. You can learn more about my artistic process, and I can learn more about your experiences and longings. Let’s see what we may discover together for our compromised, beautiful world. Sandy Eastoak is a professional artist committed to making images to help the earth heal, primarily by supporting people in recognizing, enjoying, and protecting kinship with all life. She studied art, art therapy, wildlife conservation, and writing. Her MA from University of Oregon included a thesis on art and environmental consciousness. A devoted Zen practitioner for 30 years, she slid inconspicuously into something less definable and more native. Editor of Dharma Family Treasures: Sharing Buddhism with Children (North Atlantic), she has published 7 illustrated chapbooks of her poems. She has nearly completed a book on personal relationship with spirit guides. Her art has appeared in 200 solo & group shows and is collected in 25 states and 19 countries. A founding member of Sebastopol Gallery, she also helped establish Sebastopol’s Pomo Honoring Month. She teaches art, coaches creativity, supports Native rights, and speaks about art, nature, and spirituality. Last edited by Barry; 08-15-2012 at 05:56 PM. I'm starting to think that "Painting the invisible" would be a great name for a book of poetry. Sandy, it's wonderful to hear you express your thoughts about the role of art in the world, and in your life. I need to go to the gallery and look again at all your work with new eyes. Thanks, Kalia. Painting the Invisible... I love this idea, although I've written very few poems about painting, & they're not my favorites. So you've offered quite a challenge. It excites me to think of you looking at my work with new eyes. It's a good reminder that what we say about our work can have power, can build a bridge for people to enter the world we glimpsed. The images, the words - all forms of language speaking our lives together. Last edited by Barry; 08-22-2012 at 06:08 PM. Viewing your work along with your words adds a wonderful layer that makes me go deeper into my own thoughts. Great interview. Sandy, I’ve had the privilege of seeing your art work live at the Sebastopol Gallery, and I have to say, I am always drawn into your work. After reading this interview I now know why. . . I can now see how your motivation as an artist resonates in your work. That is what pulls the viewers in. It's a pleasure to read about what motivates an artist. It's a comfort to know there are artists like Sandy who dedicate their work to healing our natural world and improving our relationship with it. Thanks also to Barry for giving local Artists increased visibility! Also looking forward to the conversation! Are you taking minutes? Barry's thread takes the minutes. I wish you could be here. Deb Grant, the lovely woman we met at the Wounded Water Ceremony, is coming to play more of her beautiful, haunting music on that strange metal instrument that looks like a miniature spacecraft. I'm curious to discover how hearing it in the gallery compares to hearing it on the bank of the Laguna! I wish you could see the show. Of course, you've seen some of the images in Barry's interview. You can see more on my Facebook page. But you miss the textures. I'm glad you're connecting via WaccoBB. Sandy, I attended the reception this evening (8/25/12). I adore your work. I had to restrain my tears of awe at the profound spirituality of your art. What I appreciate in particular is how your images create an opening for my unconscious to connect with Mystery (or the Void or the Collective Unconscious) in such a way that images and meanings are evoked that are new and fresh and meaningful. I purchase a print of "Buffalo Dreamer and Thunder Woman" that has always been profoundly evocative for me. As I told you, my son and daughter-in-law adore the watercolor I bought from you and gave them for their wedding. It is a great honor to support your artistry. I just wish I was wealthy and could do more. Everyone should own a Sandy Eastoak. Last edited by Barry; 08-26-2012 at 06:15 PM. Soooooo True, John. I've been saying that for the past few years since I first saw the painting of Thunder Woman with a full Moon behind her. It was sitting in the window on the right as you enter the gallery with samples of the other artist. It was sold shortly there after. I quickly came to understand that her work has far more depth than the layer of paint on canvas or paper. There is a part of Sandy in each painting. Her wisdom and understanding of the Beauty and Mystery of this world is reveled in a langauge we all can understand. I own several Eastoaks. My favorite is called, "Listening, Listening, Listening..." A paper, layered collage that is part of my alter. There are other works I have my eye on, but for now I am happy. I own an Eastoak. How profound the quote, "When you buy from an independent artist...." As an independent writer, I raise my voice and a piece of my heart to the truth of it. It was suggested and with Sandy's permission, I am posting an image of "Listening, Listening, O Kanzeon" (the correct name for this painting). This work speaks to me deeply and on many levels, as the layers of paper would suggest. And there is still more to be revealed. A little searching for the meaning of "Kanzeon" or "Kannon", I found online, is the Japanese name for the Bodhisattva of Compassion. Her name is usually translated as "she who hears the cries of the world." Perhaps this is why I was drawn to this artwork by Sandy. There is a part of Sandy in each painting. Her wisdom and understanding of the Beauty and Mystery of this world is reveled in a language we all can understand. I own several Eastoaks. My favorite is called, "Listening, Listening, Listening..." A paper, layered collage that is part of my alter. There are other works I have my eye on, but for now I am happy. I own an Eastoak.